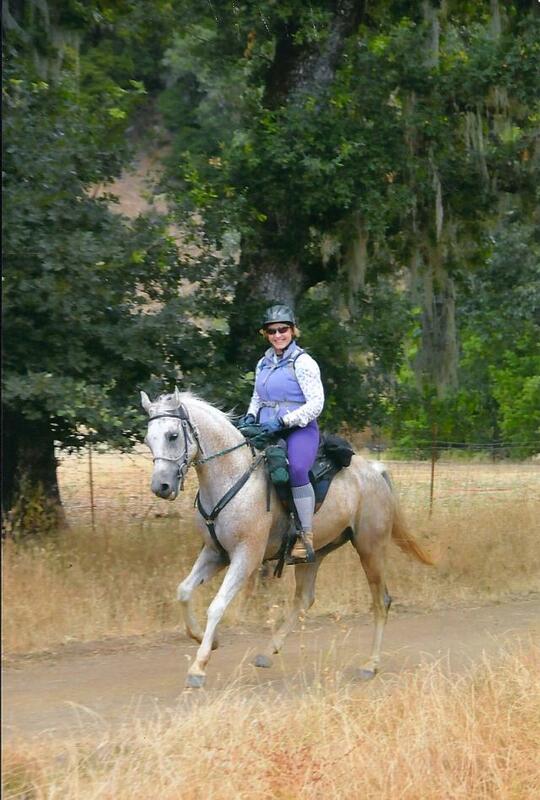 The annual Cooley Ranch Ride was held the weekend of July 16-17 in Northern Sonoma County, California. As always, it was a gorgeous and fun filled weekend, with beautiful trails, perfect weather, great management, wonderful people, awesome prizes, and incredible food and wine! Who could ask for more? This is the kind of ride that reminds me of why I am so hooked on endurance. The Cooley Ranch is a private property that has been in the same family since the 1800s. 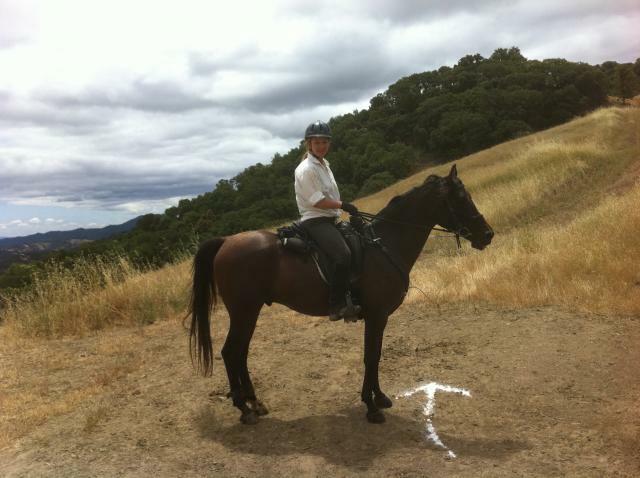 As ride managers Cynthia Ariosta and Forrest Tancer pointed out, as funds for our public parks dwindle in the state of California, it will increasingly be up to us endurance riders to cultivate relationships with private ranchers to hold rides on their lands. Crawford Cooley is extremely generous with the land and we are grateful he lets us use it. 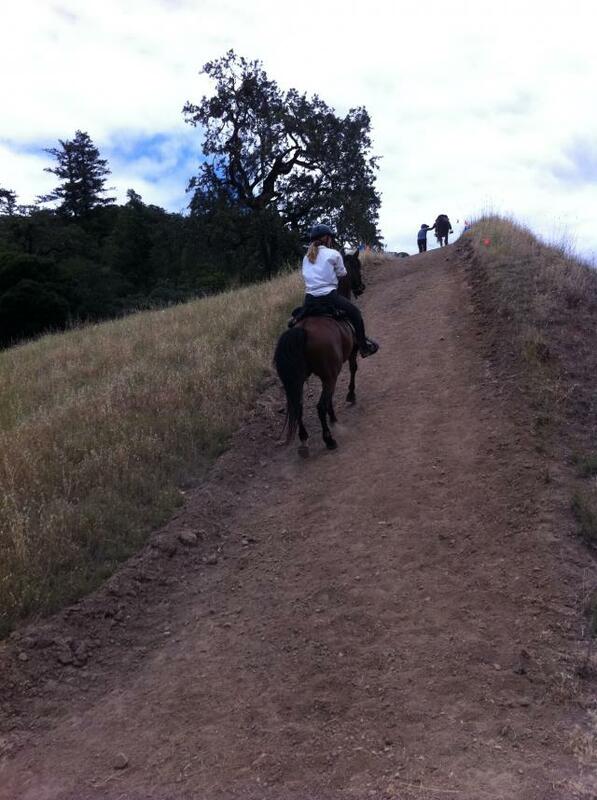 The ranch has very steep hills and is a real challenge for horse and rider. Usually the weather is hotter than it was during the weekend, but no one was complaining about that. Forrest and Cynthia did an amazing job organizing the meals: a casserole competition for Friday night with a wine tasting, a delicious paella dinner on Saturday, and a lovely dinner of roast pork loin on Sunday evening. No one wanted to leave. As far as boots for the weekend, I decided to glue them on because of all the steep hills and water crossings, plus the fact that it’s a two day ride. I figured I had spare Gloves, but at least we’d start with Glue-Ons. I’ve been having good luck with the combination of Goober Glue on the frogs and on the walls, with Adhere in the quarters and along the top seam of the boot. We booted on a very hot day, and we did the first two boots quickly, which was great. Then I opened another tube of Adhere that was either too old or just too hot and it set up before I could get the boot on. Then that happened again with another tube. A few nasty words escaped my mouth, I admit – I hate wasting boots. Finally, the third tube was fine, and we booted a few more hooves and then ran out of time. Pascale and I popped the remaining two boots on in camp. A few notes on using Adhere: 1. It has a shelf life of about a year, and it’s possible that one or both of those tubes that went bad were too old, as someone had given them to me. 2. 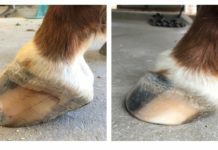 The ambient temperature is important to consider when applying boots using Adhere. On a very hot day, some find it works to keep the tube in the refrigerator before opening it so it doesn’t set up too quickly. A cooler could also work, but just be sure that no moisture gets close to the glue. In the winter months, many find it works to wrap the tubes in a heating pad for a while before applying the glue to the boots. 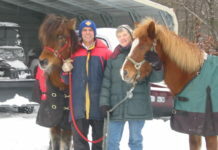 But back to the ride: The first day I rode with Pascale who was on my young horse, Brigadoon, and we had a blast. We took it pretty easy, enjoyed the views, and had no booting problems – YAY! The next day my friend Bob Spoor, whose horse Logistic had BC’d the first day, dropped the gauntlet on me and urged me to ride with him. He rides a bit more aggressively than I do, and I made it clear that I might not stay with him, even though Czeale is a veteran and able to go plenty fast. It turned out Czeale and Logistic were great together! Their gaits are well matched (even though tiny-but-mighty Czeale is probably two hands smaller than Logistic! ), they drink about the same, and they recovered about the same too. Riding with Bob is intense. He’s very competitive. We started a few minutes late so the first loop there was some question about where we were in the group. We passed a bunch of horses right off the bat. It was a lollypop shaped loop with some doubling back, and of course I didn’t have time to look at my map at any point. After awhile I noticed that we were seeing some trail for the second time and wasn’t sure if we were on the return trail or if we had missed a turn. I started to remember a time at another ride when Bob went an extra 25 miles on a 50 and we all teased him for winning the 75….! He wasn’t thinking that was so funny right then. Then we passed someone we had already gone by, who was pretty darn sure he was on trail. Hm. Somewhere we had indeed missed a turn. Fortunately we saw the way back to the vetcheck and down we went. We had simply done the lollypop twice – an extra few miles. Oh yeah and somewhere in there Czeale lost a back boot, but I taped his hoof, popped on a spare Glove and off we went – my only loss for the whole weekend. So we started loop 2 back a bit further back than we’d started, but no big deal. We just kept cruising and by the time we got to the next vet check we were back to #2 and 3. Both horses ate well, peed, and rested at the vetcheck, and we pulled out just a few minutes after the number one horse. The trail had a long stretch of flat and we cantered most of it. 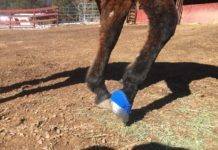 Along there we passed the number one horse walking back towards the vetcheck – he had lost a shoe and his boot had fallen off. I only had a 00.5 which wouldn’t work for his horse, so we kept moving. Then we went through a lovely long creek bed and sponged off the horses. There was a huge hill and we walked up it, and got off and walked down the other side. I walked slowly down that hill as my knee was really starting to ache – and I know it pained Bob to wait! Just as I got to him and got on, a few riders came tearing down the hill after us and passed us cantering through the rocks. We let them go for the moment. When we got to the wide open road again we started a nice easy canter and just kept going, passing both of them. There was another huge climb going into the finish, and we let the number one horse have that, as we didn’t think it was worth it to sprint up it. We finished a minute after him and both our horses recovered and showed for best condition. Bob’s horse got overall best condition for the weekend! What a fun day! What an incredible, exciting weekend! When can I go again?